For connoisseurs of the Jewish-appetizing tradition, this is shaping up to be quite a fall. Not only will we have several shiny new shops and restaurants in which to satisfy our bagel-and-lox habits, but some of these new enterprises are opening microfactories with the sole intent of flooding the market with their new-breed old-fashioned bagels. There’s a bagel war brewing, and New York’s shrinking contingent of carbivores is its lucky benefactor. 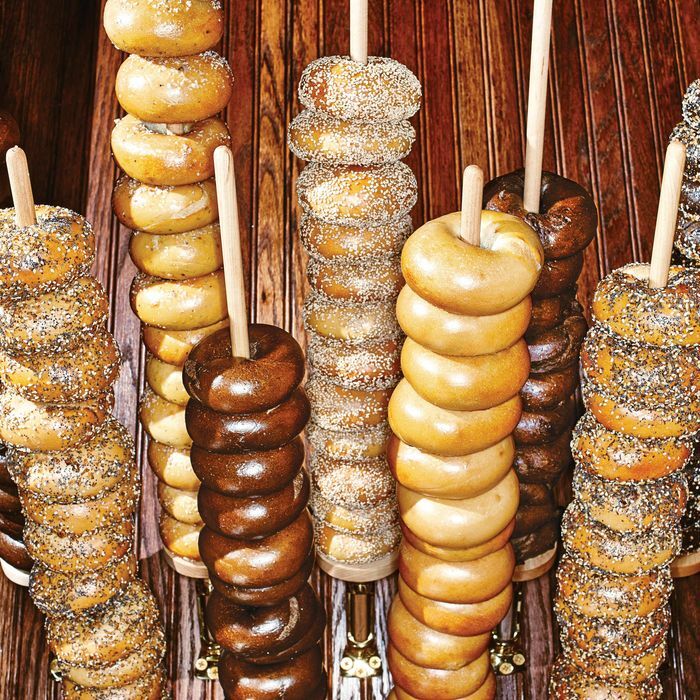 In one corner is Black Seed Bagels, a Montreal-Manhattan hybrid that commits the minor sin of putting honey in the dough and in the water in which the bagels are boiled, then baking these large-holed, slightly flattened rings in a wood-fired oven, like they do up north. The third (and largest) branch of this growing concern has annexed the East Village’s historic De Robertis bakery (176 First Ave., nr. 11th St.; no phone yet; Sept.), preserving that relic’s original penny-tile floor and tin ceiling while augmenting its own repertoire with more salads, more hot bagel sandwiches, and more pastries, from rugalach to rainbow cookies, in honor of its predecessor. 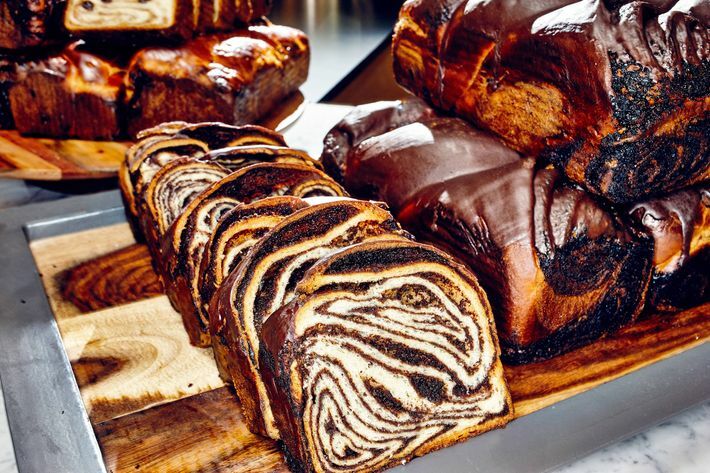 In the other corner is Russ & Daughters, the distinguished centenarian and undefeated appetizing champ that this fall, for the very first time, will begin baking its own bagels (and babka) in a newly leased Bushwick production facility. Owners Niki Russ Federman and Josh Russ Tupper have sought out retired bagel mavens to instruct them in the finer points of shaping, boiling, and baking, and hope to be in full swing by the time they open their Jewish Museum café and retail takeout space (1109 Fifth Ave., at 92nd St.; no phone yet; Nov.). And in yet another corner (this is more battle royal than bout, after all), the Major Food Group is gearing up to disrupt appetizing with Sadelle’s (463 W. Broadway, nr. 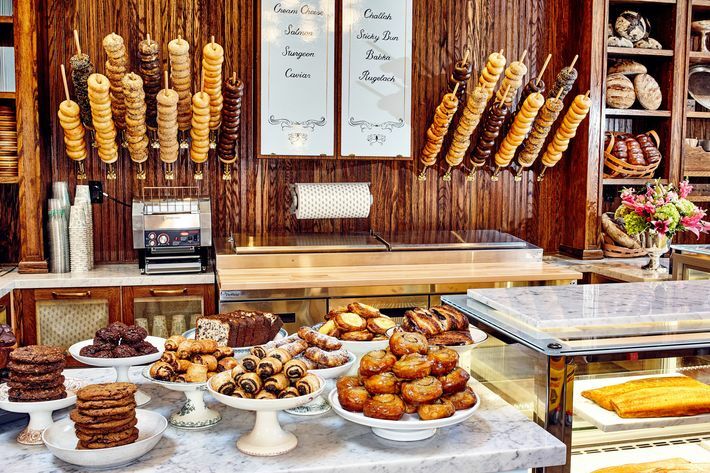 Houston St.; 212-254-3000; Sept.), a mash-up of bagel bakery, next-generation Barney Greengrass, and New York bistro (think Balthazar with a Jewish accent). Sadelle’s takes the humble schmear into brave new territory, rethinking everything from the bagel itself (deconstructed and reimagined by Per Se and Roberta’s veteran Melissa Weller) to how it’s served. Where I Tre Merli’s pizza oven once stood is now a glass-and-iron “bagel theater” showcasing the traditional revolving tray oven where Weller will bake her takes on classic flavors like salt (with cracked butcher’s pepper in the dough and Icelandic sea salt coating it) and onion (suffused with dehydrated onion, leeks, and chives). There will be salami-wrapped pigs in a blanket, an inverted-bagel grilled cheese (which partner Jeff Zalaznick says he invented in order to prevent burnt seeds), triple-decker sandwiches on caraway rye, toss-your-own composed salads, and even a large-format latke sliced with a pizza wheel and served by the wedge. The display case will be stocked with all the cheese danish, poppy-seed-curd rugalach, and chocolate babka a thoughtful houseguest could ever need (an inspirational pilgrimage was made to Walls’ in the Five Towns). And a Sunset Park commissary means there’s already a wholesale plan in place. Lastly, let’s not forget Alex Bois’s outstanding specimens (and squid-ink bialys! ), soon to appear at Philly transplant High Street on Hudson (637 Hudson St., at Horatio St.; 917-388-3944). No doubt about it: Bagels are back.